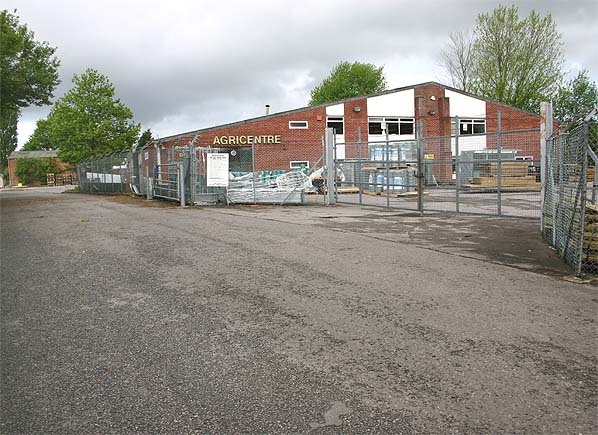 Present state: The station road industrial estate now occupies the site. Nothing remains of the station. The platform at Calne was on the north side of the line. New sidings and a loading platform were added during WW1 and the passenger platform was extend up to the water tank during 1942 as the station carried heavy military traffic for the two neighbouring RAF bases. There was a milk dock with a loading gauge opposite the passenger platform and behind this the stone built goods shed. A loading platform with wooden animal pens ran for much of the length of the goods yard. A private siding was built at the rear of the goods shed in 1927 to serve the Harris Bacon Factory; this had its own loading platform. At one time 20 loaded trucks were dispatched on a normal working day. The siding gave access to Harris's private goods yard. The railway was originally brought to Calne by the inability of the once-prosperous Calne branch of the Wilts and Berks Canal to cope efficiently with the requirements of local industry. 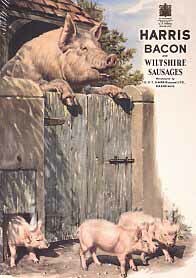 As demand grew across the country for products from the Harris Bacon Factory, Calne's main employer at the time, it became clear that a modern transport system was needed. On 8th November 1859, the first meeting to discuss opening a branch line from the GWR at Chippenham to Calne was held. The Calne Railway Company was formed and Parliament granted the necessary Act on 15th May 1860. With no tunnels required, the construction of the line was simple and was built in the broad gauge of 7' 0½" opening to freight traffic on 29th October 1863. The line was then opened to passengers from 3rd November, 1863, an unofficial holiday in Calne. From the start the service was operated by the Great Western Railway on behalf of the Calne Railway Company. Initially there were no intermediate stations on the line but a private station was opened at Black Dog Siding for Lord Lansdowne in 1863 and a halt was opened at Stanley Bridge in 1905 with the introduction of steam railcars onto the branch. In August 1874 the line was converted to standard gauge. The independent Calne Railway Company was absorbed into the GWR in 1892. 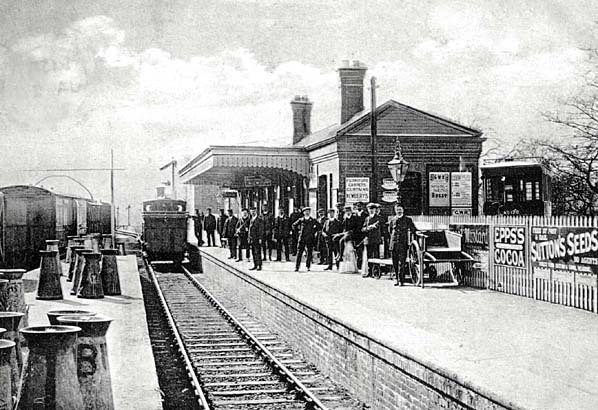 Both fright and passenger traffic was good and continued to improve through the later years of the 19th century and in 1895 the terminus at Calne underwent extensive renovations and enlargement. The steam railcars were withdrawn from the branch in the mid 1930's. The passenger station was used during WW2 to transport both servicemen and equipment to the Royal Air Force bases at Compton Bassett and Yatesbury and the goods station also saw increased trade with an increase in coal traffic, fuel for the RAF stations and animal feeds and grain for the local millers. The line had two near misses during German bombing raids in the Second World War, when bombs fell close to the station and the tracks. The line was still producing a good profit in the 1950s. Figures for the year ending September 1952, showed an income of more than £150,000, with 300,000 passengers. However, as the Harris factory began to use the roads to transport more of its products, the railway began to see a drop in revenue. 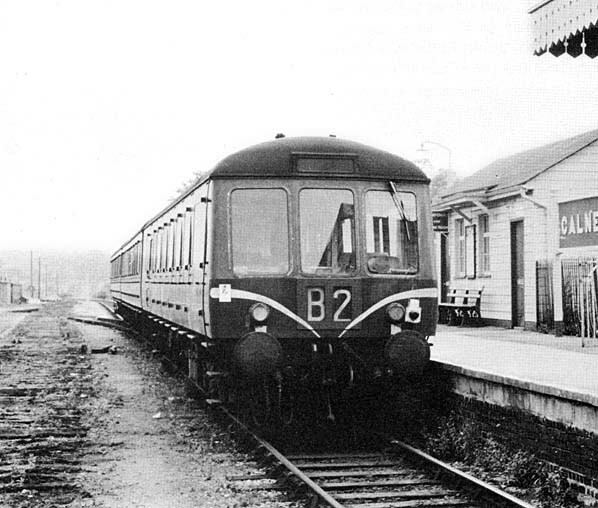 DMU's were brought onto the line in September 1958. Following the closures of the RAF stations at Yatesbury and Compton Bassett, passenger numbers diminished rapidly and by late 1963, freight services had been cut to one a weekday, while Sunday passenger services had been withdrawn. Freight services were withdrawn on 2nd November 1964 and the end was inevitable with Calne finally losing its passenger service during the Beeching cuts closing on 18th September 1965. Most of track was lifted between Easter and June 1967 leaving just a short section near the junction which was used as a siding. By 1972 a section of the track had been opened up to the public as the Marden Nature Trail and today most of the 6 mile route between Chippenham and Calne is part of the National Cycle Network and known as the Chippenham/Calne Railway Path.